CAMBRIDGE, Mass. — Hours after the teenage white hat bomber was taken into custody, the rain started. It was a warm rain, a renewing rain. This morning dogwoods were in white bloom. Puddles on the sidewalks were like mirrors, reflecting the grey sky and the long strides of runners along the Charles. It felt like the world had changed. This metropolitan region, close to where the Pilgrims landed, where Revere rode to alert the Concord and Lexington settlers, where Mark Zuckerberg founded Facebook, knows a thing or two about making history and influencing a nation. The four days of shock and outrage that started on Monday with the Boston marathon bombings on Boylston Street, and climaxed on Friday in Watertown with a flurry of bullets, was history-making in a much different dimension. On Friday morning I arrived to a nearly empty Boston Logan Airport and joined one million residents in this region in an utterly unique experience in America. It was 9:15 a.m., normally a period of high passenger traffic. But airline personnel, detailed to counters two-by-two, outnumbered passengers at most of Delta’s gate areas. I already knew that Massachusetts Governor Deval Patrick had ordered a region-wide “lockdown.” I knew public transit was shut and that taxis were barred from the airport. I followed Twitter feeds since Monday — #Boston, #marathon, #bombing — that had expanded since Thursday when the FBI released the photographs of black hat and white hat – #suspects — and then added #Watertown after midnight, when the suspects were cornered by the police. My destination was Cambridge where I’d been invited to attend the Lincoln Institute of Land Policy’s forum for journalists who report on land and the built environment. I learned from a passenger coming into the airport that there was no restriction on private vehicles arriving at the airport. I learned from another passenger that car rental agencies were providing vehicles, so I knew that was an option for driving out of Logan. Outside the terminal’s departure area I noticed that taxis were dropping passengers. The obvious response to the transport choice was to flag one of them down and ask for a ride. It was a fast trip to Harvard Square – 20 minutes max. In lockdown city, America’s newest version of urban crisis management, there’s no traffic. Storrow Drive, which runs along the south bank of the Charles River, was empty. Every lane was open, absolutely no vehicles like rural northern Michigan route 115 at a February dawn. 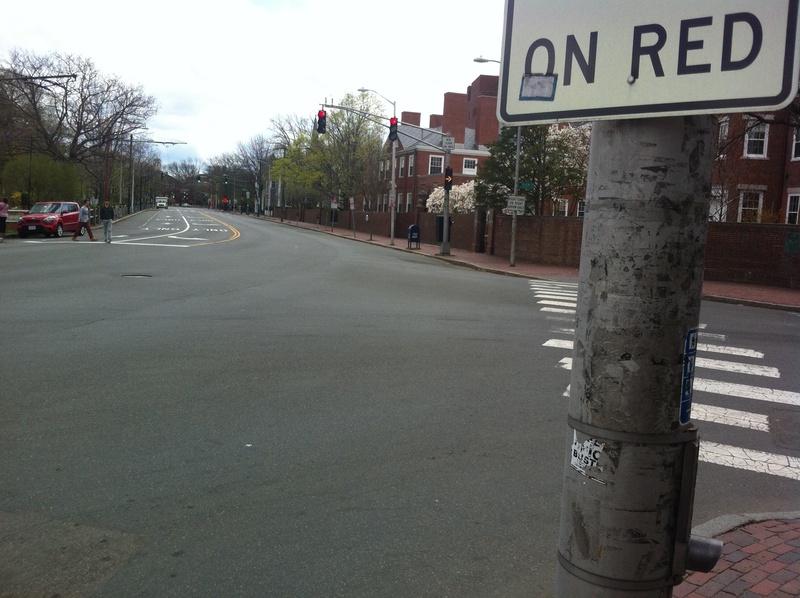 As we made our way through the streets of Cambridge, there were no cars, no pedestrians. Stores were shuttered in Harvard Square. Residents voluntarily complied with lockdown city. They had to. A colleague who lives in Cambridge told me he watched police officers stop and question people, especially male students walking in front of his home. The Lincoln Institute cancelled Friday’s program because some speakers were unable to reach Boston. Others were unable to reach the conference center. Some of the journalists attending were dispatched to cover the manhunt in Watertown, which is two miles away. 1. Government operating in an emergency, and citizens acting in agreement and compliance, established a new American response to community peril that very quickly became known here as a “lockdown.” It lasted less than 24 hours. Nevertheless, metropolitan public safety officials convinced a state governor that the potential for more deaths from a violent fugitive was so high that the lockdown was justified. Citizens apparently agreed. The empty streets and sidewalks across the city and its suburbs are prima facie evidence of the pact between officials and their civic constitutency. The precedent set in Boston is almost certain to influence decisions weighing risks and public safety in future emergencies that affect entire regions. 2. Twitter came of age as an essential source of news in a big breaking story. The 28 hours of regionwide disruption that started late Thursday afternoon with the release of photographs of black hat and white hat, and ended three hours before midnight on Friday with the capture of white hat, illustrated how ordinary citizens can perform not only as eyewitnesses, but as multi-media frontline reporters on a big story. — The police were aware that the death of the MIT officer was linked to the marathon bombers. — Police had cornered a car they had chased to Watertown. — A big firefight had erupted. — Black hat was in custody. — Then black hat was dead. It was quite the service and performance by citizen observers. They tweeted eyewitness reports from MIT, where a security guard was killed, and they tweeted from Watertown. They shot video and recorded audio of the early Friday shootout. They photographed the door-to-door Watertown search by SWAT teams during daylight hours in Watertown, and they shot the video and recorded audio of the final volley of gunshots prior to white hat’s capture. 3. Technology was big player and we’re bound to learn much more about how technology was deployed to bring to a close the first chapter of this event — bombing to suspect apprehension — between Monday and Friday. The capacity to collect and evaluate videotapes to identify two prime suspects by Thursday seems exceptional to me. And there’s a big question. We learned yesterday that the FBI, at Russia’s request, had investigated black hat and in 2011 had interviewed black hat and members of his family. How is it that the FBI in April 2013 said publicly that it did not know who either of its primary suspects were? Is the agency’s terrorist suspect network data file somehow bifurcated? Why was Russia sufficiently concerned and why weren’t we? We’ll learn more. I like the articles and I think it is cool that someone like you was there to experience and reflect on some of it. At the same time, and this has nothing to do with your clear, low key reflections, I have to say I have a somewhat ill-defined sense of unease about the prominence this story is being given in the life of the country. This story has all the elements of a great thriller movie from the two kids from Chechnya calmly planting the bombs, to hints of some source of radicalization, to the idea of an older brother sweeping his younger innocent brother into a vortex of evil, to a great chase scene(s) culminating in a house to house search, to his eluding the search and finally being found by accident by a possibly alert neighbor. At the same time, with all that, when put it its accurate non sensationalistic context, it seems like a small story looking desperately for a larger meaning. Eventually the story may unfold into a story of lasting import and meaning– larger terrorist connections, or even a lens into how otherwise good people can become alienated at latch onto a sort of evil that is floating out there when people’s dreams an values seem thwarted by the world (the later only gaining any large import as a lens for looking at the importance of truly welcoming immigrants and encouraging citizenship when because it is when you feel outside and alienated that you become susceptible to this kind of evil). Until those connections are made and the context clearly established, why is this story so big? In a city with shootings every night, why is no one asking if closing the entire city wasn’t a bit of overreach? Should we do this with all shootings where officers engage in a chase. Are we going to start shutting down neighborhoods to chase the shooters that too regularly terrorize them, but where we usually say, “Damn I lost him” and go home leaving him to shoot another day? Does this really have more import then the questions in the same news cycle about our mental health system raised by the ricin incident– questions raised already by Newtown and too many other shootings? Is this really a bigger story than the explosion in Texas which killed so many more and may have been so much more avoidable if the company had been more responsible in accessing the actual risk and OSHA had money to do the inspections needed? And while I am ranting, if shutting down the entire City with the corresponding estimated loss of millions in the local economy was good in this case, I think it might be even more effective in a different context. Why don’t we shut down every city and town in the US until Congress agrees to a budget solution? It might just work but we’ll never try it because it somehow seems appropriate in the name of a public safety hunt for one 19 year old wounded kid but seems outlandish when applied to a problem that already is devastating lives throughout the country and indirectly caused a tool in avoidable suicides and trauma that will go largely unreported and unacknowledged. And I haven’t even gotten to the comparison with the problems on the world stage, or global warming. The work you are doing to make the world aware of the water challenges and U.S. energy opportunties has a lot more import and a lot less attention….. Thanks for this report Keith. Genius writing: “Residents voluntarily complied with lockdown city. They had to.” Talk about getting the moment exactly right. I find myself thinking lots about the term “lockdown?” Before Boston didn’t it mostly mean something done to prison inmates? So, was choosing “lockdown” partly our collective (unconscious) recognition that we’re all feeling imprisoned by violence, that despite all the protestations about not giving in to terror we can’t help but do so. It seemed people welcomed a respite from the courage that daily life now requires, a chance to do something by staying safely at home. Good post! We will bee linking to this great content on our website. Keepp upp the great writing.